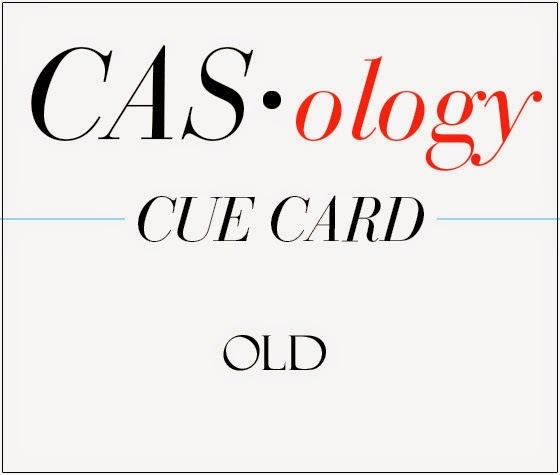 Inspired by the Casology Week #24 challenge, which is the cue "old". 1. Took some watercolor paper on which I had embossed in white some houses from Stampin Up Holiday Home. Realized that I wasn't going to use them anytime soon, so cut them into strips. 2. Watercolored strips with Tombow markers. 4. Starting in the center of the card, glued the centers only of each strip onto the card and snipped off the ends. 4. Made sentiment (one dear to my heart) with a Dymo Label maker (love that toy). Wonderful card. You are a genius at design. Not only clever... it looks fab too! Well thanks for popping over to my blog! Have I mentioned i am SO GLAD you are back stamping? :) I also love my Dymo label maker -- mine is 30 years old! Gotta love a "keeper" DH. Love the strips on your card too!! thanks; my MISTI looks 100 years old. I hope this thing can't wear out. I use it all the time! I really like the effect of having used the embossed houses to create your strips - for me it gives them the feel of one of lines on a graph, and I like it a lot. I love my Dymo too - and was delighted when I recently found some fancy coloured labels by Artemio. Much easier than my other "colour" alternative which was cutting strips of light card. Hmm, I should keep it somewhere more accessible!! This is a wonderful love card. So clever with the strips of paper, and I just adore that sentiment. Thanks so much for playing along at CASology this week. What a fun card Joan! Wonderful colors of watercolor paired with the lable, ultra trendy and FUN, and romantic!! Thanks for joining us at CASology this week!! 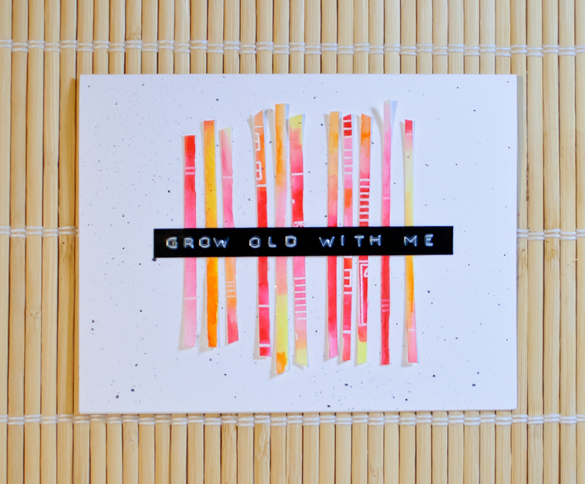 Love the bursts of colour on this - a really fun card! So glad you joined us at CASology this week! Well, it's different. I'll give it that. Beautiful design!!! Thank you so much for sharing your creativity with us at CASology. I love every thing about this!! I love the dymo label against your watercolors!! So pretty! Love the artsy look! This is really cool! Different in a good way!! So cool! Love the contrast between the colored strips and Dymo sentiment! Another simple and perfect card! The embossing add a nice texture and effect to the strips. They remind me of batik almost. Love this - the dyno label is awesome! What a lovely and creative way to bring joy to your love one! And more than that we are very happy to see that our little Dymo inspires such creativity! Thank you for sharing your wonderful work and we are looking forward to see other great ideas! Happy Holidays!